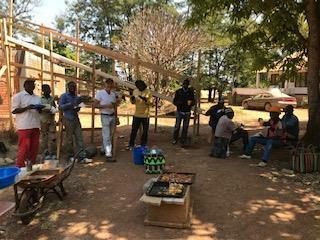 The Bible House construction crew were treated to a delightful Christmas feast of pizza and watermelon. 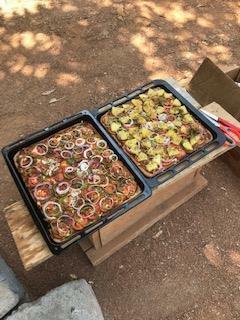 Supporting a local entrepenuer, the party was catered by a local woman who has recently started up a pizza business to earn some extra money. With some of the metalwork in place, the shape of the roof is becoming apparent. 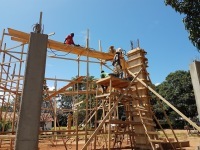 A ramp has been built to move material and people to the top more easily. 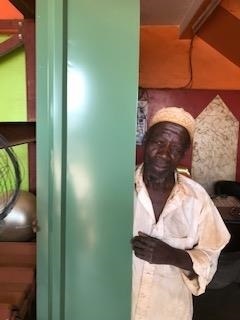 The colour of the roofing has been chosen -- a rich bright green. Much has been accomplished in the past few weeks. Doors and windows have been framed. Pastor Touka is looking quite pleased. 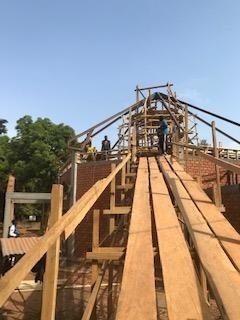 Starting to build the walls, one brick at a time, Mr. Oumarou gives the honour of placing the first bricks to Pastor Touka and Pastor Federwitz. Martin Weber eyes up the pillar along with the rest of the group, certain that it is straight and strong. Pastor Touka describes the work which will go on in the side rooms surrounding the central main hall. Missionary/Translator Martin Weber (left), Rev. 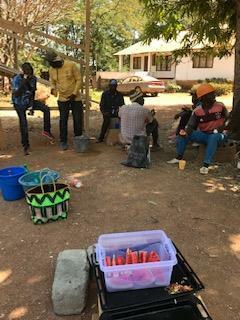 Touka Daniel, EELC Director of Translation and Literacy (centre right), and Mr. Oumarou, Construction Supervisor (right) welcome Rev. 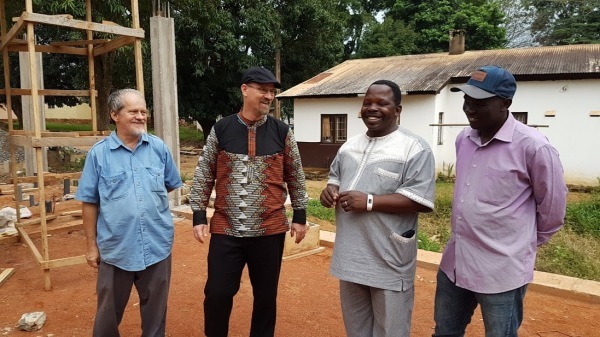 David Federwitz, LBTC/LBT-US Regional Director (centre left) and share with him the progress being made on the Bible House. Rebar is put in place and forms are built. 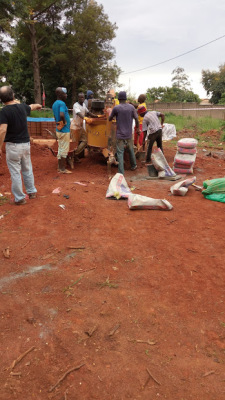 Concrete is mixed (mostly by hand) and poured. With the foundation poured and the footings set in place, we can begin to see the shape of the building. The octagonal central area is surrounded by offices and work areas. 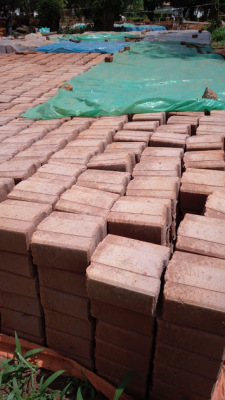 Resulted in this massive amount of bricks, neatly stacked, curing and drying in the sun, and soon ready to make up the walls of the Bible House! 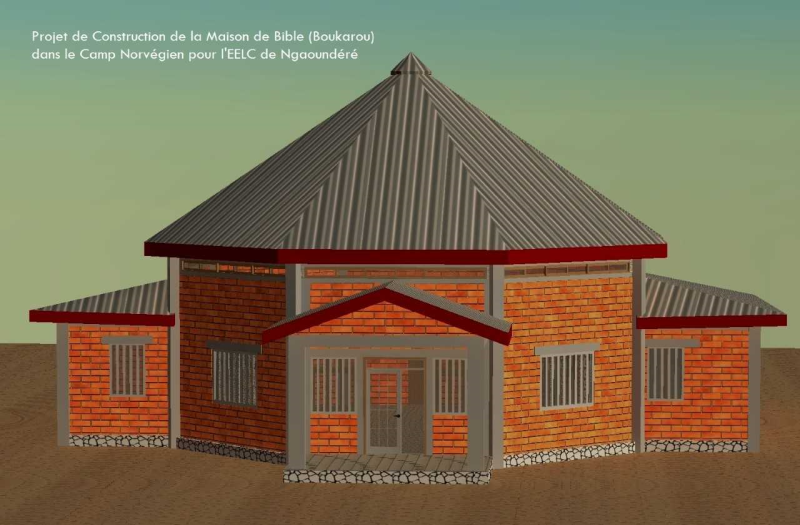 This centre for ​both Bible translation and literacy training will be built on the grounds of the Evangelical Lutheran Church of Cameroon (EELC) in Ngaoundere, Cameroon. We have acquired the land and are preparing to break ground soon. ​The unique ​octagonal shape was thought to be the best possible configuration. 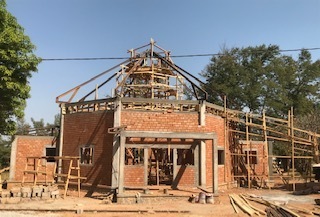 It is hoped that the Bible House will be a contribution to the Cameroonian Lutheran church and the translation teams that will be in service for many years. 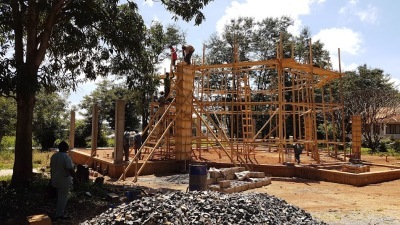 Upon completion the building will house 4-6 translation projects simultaneously, allowing for each to enjoy dedicated work space, and to share resources with the others. 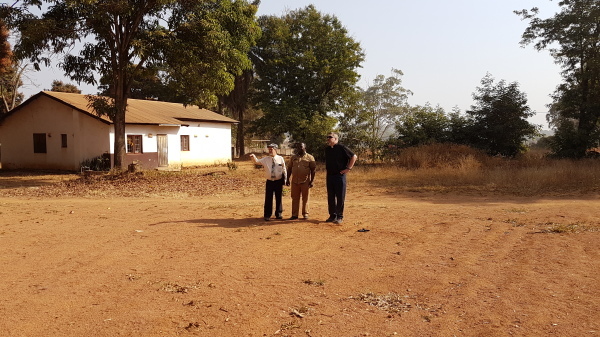 Dr. James Keller, LBTC's former Execuative Director, is joined by Rev Touka Daniel (centre) representing the EELC, and Martin Weber (left), longtime LBTC missionary, on the newly cleared grounds of the Ngaoundere Bible House. 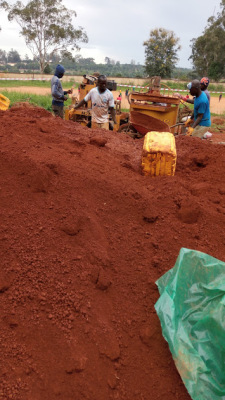 The foundation is scheduled to be poured soon. Please keep the project in your prayers.